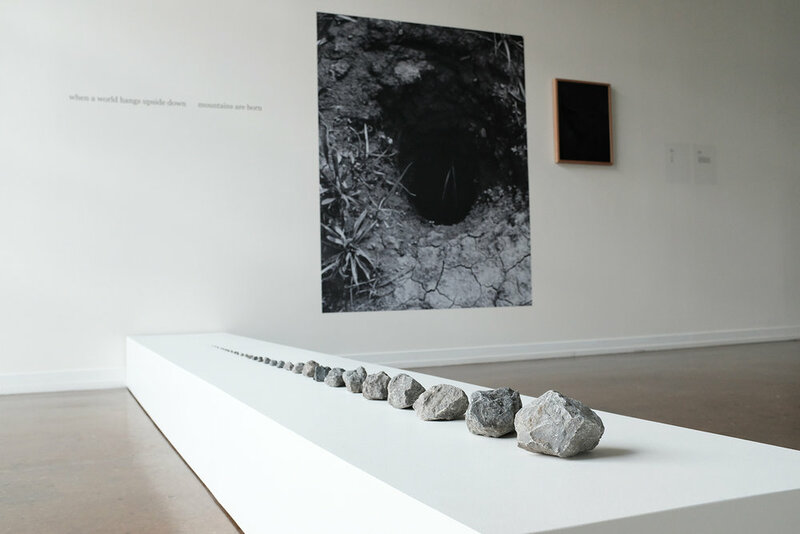 Zeitgeist’s current exhibit, Land Derived Sentiments: Poems and Responses was curated by artist Patrick DeGuira. Each piece is a response to his new book of poetry inspired by nature, Land Derived Sentiments. The exhibit is on view through April 27, 2019. There will be a poetry reading in conjunction with the exhibit at The Bookshop on April 7. More info on the show and the reading here. Zeitgeist: What inspired you to start writing poetry? Patrick DeGuira: My process is open and I often work in a variety of mediums concurrently. That said, creative writing has always been an aspect of my visual practice. Poetic writing and organizing exhibitions helps me visualize and better understand objects, space and materials, while experiencing the changing world more fully… directly, politically... hopefully allowing me to be in conversation with a wider audience. What did you consider when selecting artists for this show? It was important that many visual forms be represented in this exhibition. Each of us experience poetic, political or observational spaces differently. For some it is more realistically or drawn from a documentarian space, others experience the world more abstractly, narratively or emotionally. Most importantly, each artist in this exhibition is empathetic and poetic in their own right. Each were excited to interpret my writing, trusted me to interpret their work and create an interesting dialogue amongst the final works on display. You assigned each artist a poem to react to. Were there any interpretations that surprised you? Any that really excited you or expanded the meaning of the poem? I am most excited about the overall flow of the show; its relationship to language, questions pertaining to human-nature struggles, and that Zeitgeist provides space for political assertion. I feel Adam Henry’s interpretation and the collaborative work of Lenka Clayton and Phillip Andrew Lewis were both stunning. Henry explores light, refraction and dualities in ways that feel true to the poem If a Window. And I really love the material, conceptual and economical presence of Clayton and Lewis’ Rock Fade (Moon Rock). What made it so vital to talk about nature now? Unfortunately for humans, “nature” and the destruction of nature are synonymous. In other words, the promise of our “nature” is dependent on ecological partnerships we’ve helped forge and misalign. And while environmental balance is of pressing concern to our own, nowhere is a crisis more evident than in our disregard for these fundamental life supporting systems. We have forced an environmental crisis to occur and we can no longer simply reflect on the destructive aspects of our cause, nor can we surrender to climate skepticism, because these partnerships must continue and thrive. What can one do as an artist to have an impact on the environment? Climate change is asking us to care about the environment as much as our own future. Artists can create emotional experiences as political spaces, can make more with less… they can focus on process rather than consumer product. These choices can impact environmental outcomes and bring attention to these issues. Although art represents space where people can come together to share an experience, I feel that it is important that art be liberating rather than simply entertaining. And each of us must find ways to develop a process; one that reaches beyond our chosen area of study. On a practical level, I work to live a considered and environmentally conscious life; to make art about this, and be in conversation with and promote the work of others who make similar choices. I am inspired to dismantle dirty industry, inspired to support government that insists future economies and political representatives not falsify climate imbalance. I am inspired to teach my children the same. I am in awe of the work of young activists Greta Thunberg, Xiuhtezcatl Martinez and Jamie Saraí Margolin, the writings of David George Haskell, and organizations such as 350.org, the Sunrise Movement, and the Land Trust of Tennessee… not to mention, concepts like the Green New Deal. In my mind, the very act of being an artist is being a bridge to the possibilities of a politically engaged life.